In silver, the total open interest ROSE by 1,281 contracts UP to 192,661 with respect to YESTERDAY’S TRADING. In ounces, the OI is still represented by just less THAN 1 BILLION oz i.e. 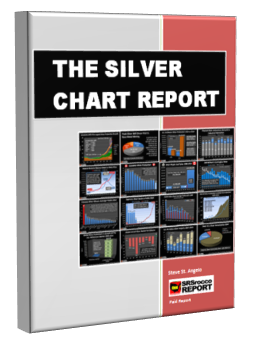 .963 BILLION TO BE EXACT or 138% of annual global silver production (ex Russia & ex China). ii)USA oil rigs continue to escalate in count which no doubt raises total crude production. What will OPEC do if the market does bit rebalance? i)A great commentary from Steve St Angelo. 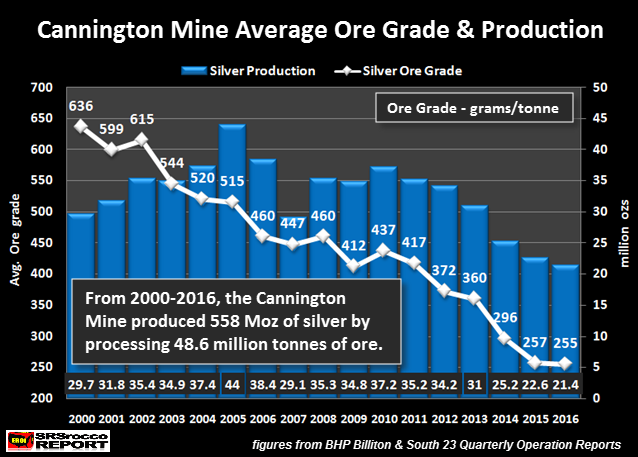 The Cannington mine in Australia’s has always been a big producer of silver. 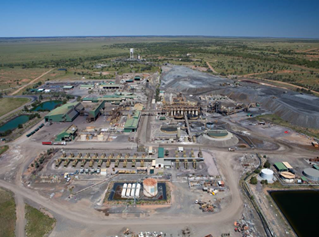 This mine is now owned by South 32 having been spun out of BHP Billiton. We have seen silver production fall as base metal production falters. Now we are witnessing silver production falter as mining does deeper into the mines. Silver is lighter and generally floats to the surface while gold is denser. Thus as you go deeper into the lens silver values decrease. This is generally true in primary silver mines as well. The total gold comex open interest FELL BY 6954 CONTRACTS UP to an OI level of 417,117 WITH THE FALL IN THE PRICE OF GOLD ( $2.50 with YESTERDAY’S trading). We are now in the contract month of FEBRUARY and it is one of the better delivery months of the year. In this next big active delivery month of February we had a LOSS of 35 contracts DOWN to 1352. We had 0 notices served upon yesterday and therefore we LOST 35 contracts or an additional 3500 oz will NOT stand for delivery and these were cash settled for a fiat bonus. The next non active contract month of March saw it’s OI RISE by 75 contracts UP to 2154.The next big active month is April and here the OI FELL by 8587 contracts DOWN to 280,301. 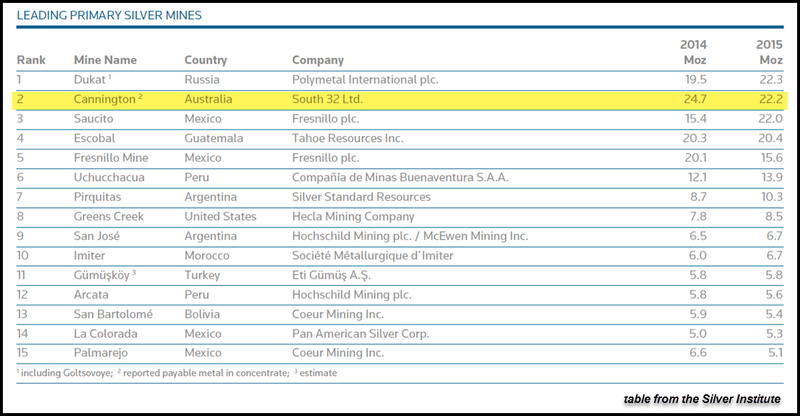 And now for the wild silver comex results. Total silver OI ROSE by 1281 contracts FROM 191,380 UP TO 192,661 as the price of silver ROSE IN PRICE TO THE TUNE OF 4 CENTS with respect to YESTERDAY’S trading. We are moving further from the all time record high for silver open interest set on Wednesday August 3/2016: (224,540). The active month of February saw the OI RISE by 106 contract(s) UP TO 285. We had 0 notice(s) served upon yesterday so we GAINED 106 CONTRACTS or an additional 530,000 oz will stand. The next big active delivery month is March and here the OI decrease by 7397 contracts down to 106,030 contracts. For comparison purposes last year on the same date only 90,156 contracts were standing. We had 100 notice(s) filed for 500,000 oz for the FEBRUARY contract. Today the estimated volume was 224,836 contracts which is good. Today, 0 notice(s) were issued from JPMorgan dealer account and 0 notices were issued from their client or customer account. The total of all issuance by all participants equates to 3 contract(s) of which 0 notices were stopped (received) by jPMorgan dealer and 1 notice(s) was (were) stopped/ Received) by jPMorgan customer account. To calculate the initial total number of gold ounces standing for the FEBRUARY. contract month, we take the total number of notices filed so far for the month (5122) x 100 oz or 512,200 oz, to which we add the difference between the open interest for the front month of FEBRUARY (1352 contracts) minus the number of notices served upon today (3) x 100 oz per contract equals 647,100 oz, the number of ounces standing in this active month of FEBRUARY. 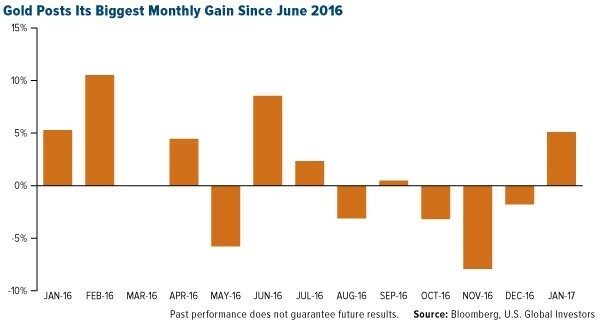 we lost 35 contracts or an additional 3500 oz will not stand in this active delivery month. On first day notice for FEB 2016, we had 20.124 tonnes of gold standing. At the conclusion of the month we had only 7.9876 tonnes standing. The data suggests that we had almost identical amounts standing in Feb ’16 and Feb 2017; however today’s totals already surpassed the final amt which eventually stood in 2016. (already 15.931 tonnes vs 7.9876 at the end of Feb). average 17.580 tonnes per month vs last yr 59.51 tonnes total for 14 months or 4.250 tonnes average per month (last yr). IN THE LAST 6 MONTHS 75 NET TONNES HAS LEFT THE COMEX. Thus the initial standings for silver for the FEBRUARY contract month: 247(notices served so far)x 5000 oz + OI for front month of FEB.( 285 ) -number of notices served upon today (100)x 5000 oz equals 2,160,000 oz of silver standing for the Feb contract month. This is huge for a non active delivery month in silver. We gained 106 contracts or an additional 530,000 oz will stand for delivery. Today the estimated volume was 108,451 which is absolutely huge!!! FRIDAY’S confirmed volume was 86,492 contracts which is very good. those commercials that have been short in gold added 6583 contracts to their short side. those small specs that have been short in gold covered 2212 contracts from their short side. Our large specs that have been long in silver added only 955 contracts to their long side. Our large specs that have been short in silver covered 972 contracts from their short side. those commercials that have been short in silver added 4538 contracts to their short side. those small specs that have been long in silver added 2087 contracts to their long side. those small specs that have been short in silver added 890 contracts to their short side. the commercials go net short again by 3124 contracts. They seem emboldened again by continuing their supply of non backed silver paper. *LAST 34 TRADING DAYS: A NET 8.04 TONNES HAVE NOW BEEN ADDED INTO GLD INVENTORY. Note: Sprott silver trust back into NEGATIVE territory at -0.26% /Sprott physical gold trust is back into NEGATIVE territory at -0.050%/Central fund of Canada’s is still in jail. The problem with Williams’ conclusion is that gold is not really “impossible to produce from thin air.” Rather, central banks lease, swap, and sell gold nearly every day, causing it to be hypothecated and rehypothecated, creating vast imaginary supply, just as vast imaginary supply is created every day on futures exchanges. What will cause that inability? If not international agreement — that is, the changed interests of governments and central banks — then only the wising up of gold investors and gold mining companies, which, as you may have noticed, has been taking quite a while. A great commentary from Steve St Angelo. 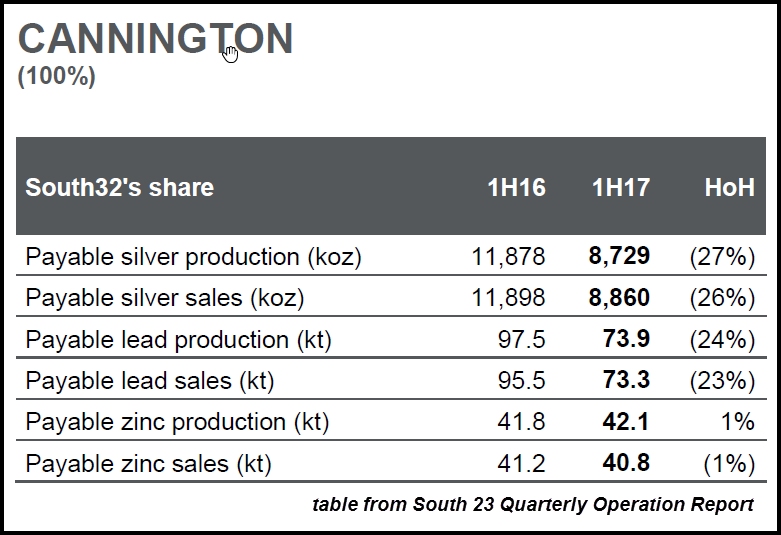 The Cannington mine in Australia’s has always been a big producer of silver. This mine is now owned by South 32 having been spun out of BHP Billiton. We have seen silver production fall as base metal production falters. Now we are witnessing silver production falter as mining does deeper into the mines. Silver is lighter and generally floats to the surface while gold is denser. Thus as you go deeper into the lens silver values decrease. This is generally true in primary silver mines as well. 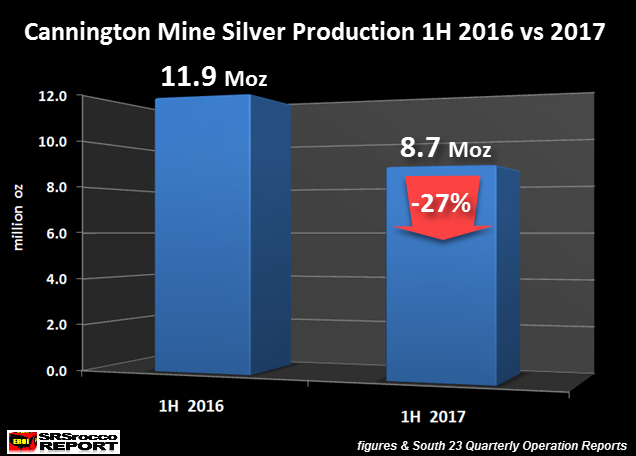 Silver production at the Cannington Mine declined from 11.9 million oz (Moz) 1H 2016 to 8.7 Moz 1H 2017. Basically, these figures are comparing production from July-Dec 2015 versus July-Dec 2016. Again, the latter reporting period is stated as the first half of 2017 (1H 2017). 3b Japan 10 year bond yield: FALLS TO +.092%/ !!!! (Japan buying 100% of bond issuance)/Japanese yen vs usa cross now at 113.52/ THIS IS TROUBLESOME AS BANK OF JAPAN IS RUNNING OUT OF BONDS TO BUY./JAPAN 10 YR YIELD FINALLY IN THE POSITIVE/BANK OF JAPAN LOSING CONTROL OF THEIR YIELD CURVE AS THEY PURCHASE ALL BONDS TO GET TO ZERO RATE!! 30 SNB (Swiss National Bank) still intervening again in the markets driving down the SF. It is not working: USA/SF this morning 1.0037 as the Swiss Franc is still rising against most currencies. Euro vs SF is 1.0668 well above the floor set by the Swiss Finance Minister. Thomas Jordan, chief of the Swiss National Bank continues to purchase euros trying to lower value of the Swiss Franc. S&P futures rose further into record territory, European shares rose to within striking distance of their highest levels in more than a year while bonds fell and the dollar rose as investors cheered a surge in Chinese trade data amid hopes of “phenomenal” tax cuts by Donald Trump, all of which have rekindled the Trumpflation trade. The main economic release overnight was China’s trade data, which saw China post much stronger-than-expected exports and imports for January as demand picked up at home and abroad, however celebreations of a Chinese trade renaissance may be premature because as Goldman pointed out in a note, “the early Chinese New Year appears to have distorted January trade data (especially exports) on the upside.” Reuters agreed, noting that China watchers warned the long Lunar New Year holidays may have distorted the data to some degree, with companies pumping up production or rushing to build inventories before the break, which can last for weeks. Concerns aside, China’s imports in January rose at the fastest pace since 2013, fueled by a continued construction boom which is boosting demand and global prices for resources from copper to steel, preliminary customs data showed on Friday. The 16.7% surge eclipsed the consensus estimate of 10.0%. China’s imports from the United States rose 23.4 percent in January, the fastest pace in at least a year, while its monthly trade surplus with the U.S. dipped to $21.37 billion. Led by electronics, China’s January exports climbed the most in almost a year, adding to evidence that Asia’s long trade recession may be bottoming out. January shipments rose 7.9 percent, more than twice as much as expected, after 2016 exports slumped nearly 8 percent. China’s strong trade growth lifted shares of commodity-related sectors, in particular blue chip mining, across Europe helping regional indexes inch higher back towards last month’s peaks. Aside from China, the positive tone was driven by a return of the “Trump reflation trade”, following Trump’s comments on Thursday that in coming weeks he would announce something “phenomenal” in terms of tax although he offered no further details. Renewed speculation that Trump’s economic policies will help boost economic growth and inflation pushed U.S. Treasury yields higher and lifted the dollar. “President Trump promising tax reform in 2-3 weeks (potentially at the Feb 28 address to Congress) has added to risk bullish sentiment,” said Morgan Stanley strategists in a note to clients. In early trading, Europe’s Stoxx 600 rose 0.2% and was poised to end the week about 1% higher helped by healthy corporate profits and a continued uptick in regional dealmaking which is seeing its strongest start to the year in more than a decade also helped underpin valuations. Futures on Wall Street’s three main indexes all notched record highs overnight. 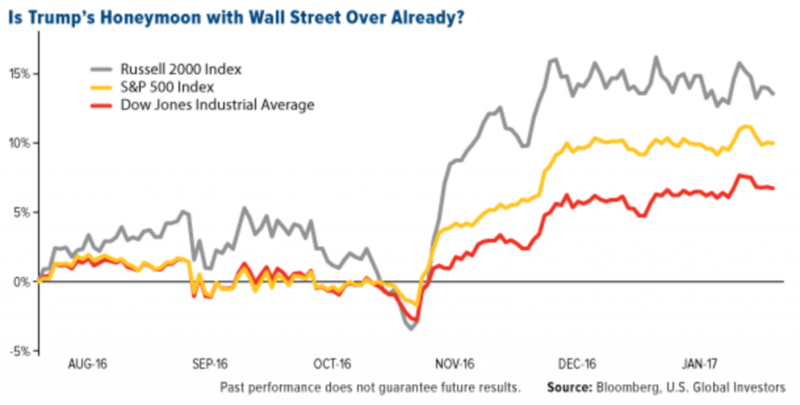 As Bank of America highlighted overnight, the broad bullish sentiment was evident in investment flows too with investors pumping $13 billion into bonds, $6 billion into equities and even $2 billion into gold, in the past week according to latest data, although US equities continued to see outflows in 4 of the past 5 weeks. As noted earlier, sentiment got a further boost on the political front when Trump seemed to change tack and said he would honor the longstanding “one China” policy during a phone call with China’s leader, a major diplomatic boost for Beijing which brooks no criticism of its claim to neighboring Taiwan. Geopolitical focus now shifts to a meeting later on Friday between Trump and Japan’s Prime Minister Shinzo Abe in which Abe is expected to propose a new cabinet level framework for U.S.-Japan talks on trade, security and macroeconomic issues, including currencies. Asia equity markets carried over the momentum from the latest record day on Wall Street where the major indices printed fresh all-time highs as sentiment was underpinned by comments from US President Trump who will announce tax reforms in the upcoming 2-3 weeks. ASX 200 (+1.0%) was led by financial and energy names following similar outperformance in US, while Nikkei 225 (+2.6%) coat-tailed on the surge in USD/JPY which broke firmly above 113.00. Hang Seng (+0.6%) and Shanghai Comp (+0.4%). conformed to the widespread positive tone amid encouraging trade figures in which trade balance, exports and imports all beat estimates in both USD and CNY terms. 10yr JGBs saw spill-over selling from T-notes amid increases in global yields, although losses were stemmed after the BoJ raised the amount of JGB buying in the 10yr-25yr for today’s Rinban operations. The final European session of the week has seen EU bourses supported by the strong lead from their US and Asian counterparts. Oil prices are at intra-day highs in the wake of the !EA monthly report, whereby they raised their global oil demand, while highlight that OPEC compliance is up to 90% with OECD stockpiles falling the most in 3-yrs. Elsewhere, the material sector outperforms amid China’s wider than expected trade surplus overnight, while firm earnings from ArcelorMittal has also supported the sector. Eurozone debt has been a touch softer across the board with bund prices flirting around 164.00 with the weakness led by the long of the curve, while the GE-FR 10yr spread back at 70bps having widened 3.2bps. In currencies, the Bloomberg Dollar Spot Index rose less than 0.1 percent after Thursday’s 0.3 percent advance, and is poised to snap a six-week losing streak. The euro and British pound were both little changed. Citigroup Inc., the world’s largest foreign-exchange trading firm, sees the dollar rising this year even as the president talks the greenback down. Thin trading conditions still in evidence, with notable order levels intact as we head towards the weekend. In the lead USD pairings the recovery in the JPY spot rate has stalled ahead of initial resistance at 113.90-114.00, but the shallow pull-back suggests we are still well placed for an eventual test later in the session. Similarly in EUR/USD, pre 1.0616 bids continue to hold up a ‘much-anticipated’ downturn, but political risk seems to be tempered by German discord on how to accommodate the recent rise(s) in inflation. In the UK, strong manufacturing and industrial numbers beat expectations on all fronts, with the EU and non EU trade balances narrowing. GBP gains were muted however, though the data did manage to reverse some of the early morning weakness seen across the board. We continue to see sub 0.8500 demand holding up the EUR/GBP rate, while Cable through 1.2500 is finding it hard going, especially after coming against the strong resistance in the 1.2550-1.2600 zone. In commodities, oil added 1 percent to $53.53 a barrel Friday after it climbed 1.3 percent the previous session. Gold fell 0.3 percent to $1,224.41 an ounce, after dropping 1.1 percent on Thursday. 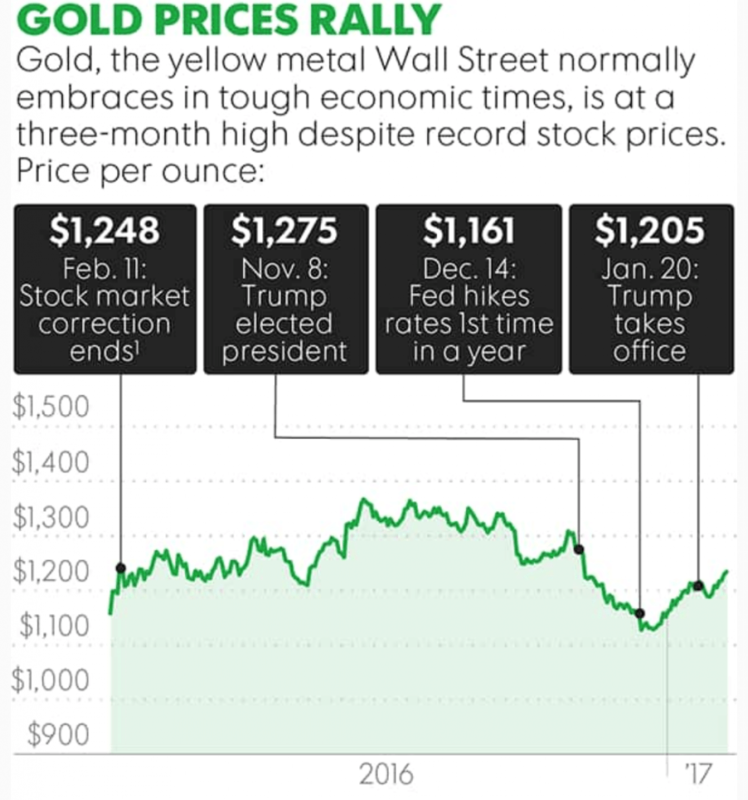 The metal, which is considered a haven asset, was at a three-month high earlier in the week. Iron ore futures jumped 3.8 percent in a fourth consecutive day of gains exceeding 1 percent. The !EA report dominated the headlines this morning, with 2017 Oil demand growth forecast to rise by 100k bpd. Production also fell by 1k in Jan to raise OPEC output (cut) compliance to 90% – 82% previously. This naturally saw WTI and Brent both rallying, but recent ranges look ‘safe’, with WTI through USD53.00 but still holding comfortably off the USD55.00 upper band. Notable losses in Gold after the moderate USD recovery and fresh record highs on Wall Street. Gains in the week stopped well short of key resistance at USD1250.00, moving down from USD1243 to USD1222.5 today. Strong gains in base metals on strong Chinese demand reported through Jan — Copper is back to USD2.70, but Zinc and Lead the out-performers — both gaining 2.5% on the day. !EA Monthly Report says they have raised their 2017 global oil demand growth forecast by 100,000bpd to 1.4mln bpd and estimate that OPEC are working with a 90% level of compliance to their output cut deal. OECD stock piles decline by 800,000bpd during Q4; most in three years. Metaphorically President Trump yesterday got his driver out and launched it high into the financial market fairway as he let the world know that there would be a “phenomenal” tax plan in the next two or three weeks in a meeting with US airline executives. During a press briefing later on in the day with White House Press Secretary Sean Spicer the question was asked whether or not this comment was corporate focused to which Spicer said it will be a “comprehensive” package and one “that will address both the business side of the tax ledger as well as the individual rates”. Trump also confirmed that he is working on seeking to roll back “burdensome regulations” and change the country’s “obsolete” infrastructure system. Markets are certainly going into the end of the week in a better mood. The S&P 500 (+0.58%) and Dow (+0.59%) both hit fresh record highs last night with financials leading the charge on those Trump comments, as well as airlines. Interestingly Bloomberg ran a story overnight saying that DB’s Binky Chanda is now the most bullish US equity strategist of all the analysts they poll. Binky’s year end target is a lofty 2600 for the S&P500. In a major reversal to his stated foreign policy framework with China, in his first phone call held with China’s president Xi Jinping held on Thursday night, President Donald Trump agreed to honor the “one China” policy, easing a key source of diplomatic tension between the world’s two largest economies. The phone call came just one day after Trump sent Xi a letter stating he seeks a “constructive relationship” with China, took place hours after a US Appeals Court ruled against the Trump Administration’s executive order on immigration, and came ahead of Trump’s first official meeting with Japan’s PM Shinzo Abe. In December, then president-elect Trump angered Beijing by talking to the president of Taiwan and saying the United States did not have to stick to the policy, under which Washington acknowledges the Chinese position that there is only one China and Taiwan is part of it. Trump later said the policy is “open to negotiation” putting further pressure on US-China relations. No issue is more sensitive to Beijing than Taiwan. China and the United States also signaled that with the “one China” issue resolved, they could have more normal relations. Below is a full timeline of Trump’s stance on the “One China” policy courtesy of Reuters. Dec 2 – Trump speaks by phone with President Tsai Ing-wen of Taiwan, a move that is likely to infuriate China, which considers the self-ruled island its own, and complicate U.S. relations with Beijing. China lodges swift protest, blaming Taiwan for the petty move. Dec 11 – Trump says the United States did not necessarily have to stick to its long-standing position that Taiwan is part of “one China,” questioning nearly four decades of U.S. policy. Dec 12 – China expresses “serious concern” after Trump said the United States did not necessarily have to stick to its long-held stance that Taiwan is part of “one China”. Dec 14 – In a veiled warning to Trump, China’s ambassador to the United States says Beijing will never bargain with Washington over issues involving its national sovereignty or territorial integrity. Jan 11 – Taiwan scrambles jets and navy ships after a group of Chinese warships, led by its sole aircraft carrier, sailed through the Taiwan Strait, the latest sign of heightened tension between Beijing and the island. Jan 12 – Trump’s then nominee for secretary of state, Rex Tillerson, says China should be denied access to islands it has built in the contested South China Sea, describing the placing of military assets there as “akin to Russia’s taking Crimea” from Ukraine. Feb 3 – China’s top diplomat, Yang Jiechi, tells Michael Flynn, Trump’s National Security Advisor, that China hopes it can work with the United States to manage and control disputes and sensitive problems. Feb 9 – Trump breaks the ice with Xi in a letter that says he looks forward to working with him to develop relations. Feb 9 – Trump changes tack and agrees to honor the “one China” policy during a phone call with Xi. Lu added that “ensuring this political basis does not waver is vital for the healthy, stable development of China-U.S. relations,” Lu said. In a separate statement carried by China’s Foreign Ministry, Xi said China appreciated Trump’s upholding of the “one China” policy. “I believe that the United States and China are cooperative partners, and through joint efforts we can push bilateral relations to a historic new high,” the statement quoted Xi as saying. “The development of China and the United States absolutely can complement each other and advance together. Both sides absolutely can become very good cooperative partners,” Xi said. Taiwan’s top China policymaker, the Mainland Affairs Council, said it hoped for continued support from the United States and called on Beijing to adopt a “positive attitude” and “pragmatic communication” in resolving differences with Taiwan. China is deeply suspicious of Tsai, whose ruling Democratic Progressive Party espouses the island’s formal independence, a red line for Beijing, and has cut off a formal dialogue mechanism with the island. Tsai says she wants peace with China. In a statement to Reuters, lawyer James Zimmerman, the former head of the American Chamber of Commerce in China, said Trump should have never raised the “one China” policy in the first place. “There is certainly a way of negotiating with the Chinese, but threats concerning fundamental, core interests are counterproductive from the get-go,” he said in an email. The White House described the call, which came hours before Trump plays host to Japanese Prime Minister Shinzo Abe, as “extremely cordial”, with both leaders expressing best wishes to their peoples. There was little or no mention in either the Chinese or U.S. statement of other contentious issues – trade and the disputed South China Sea – and neither matter has gone away. China on Friday reported an initial trade surplus of $51.35 billion for January, more than $21 billion of which was with the United States. The game playing in Greece gets curiouser and curiouser. German finance minister Wolfgang Schäuble went on TV saying the only way Greece can get a haircut is if it leaves the Eurozone. The IMF reiterated that Greece will not be able to make its payments. Greece insists the IMF is wrong, yet it wants credit relief. 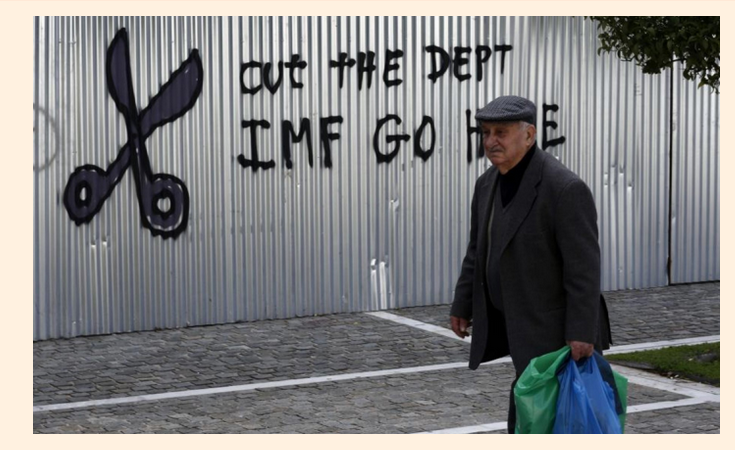 The Financial Times reports Greeks Escalate Bailout Divisions by Lashing out at ‘Misleading’ IMF Report. Greece’s finance minister has lashed out at the International Monetary Fund’s “misleading” analysis of the country’s economic health and debt trajectory, intensifying a rift between Athens and the Fund over its involvement in the country’s three-year bailout programme. Responding to the IMF’s 91-page healthcheck of the Greek economy, Syriza’s Euclid Tsakalotos said the analysis gave an unfair and “insufficient” account of reform efforts undertaken by the left-wing government since the summer of 2015. Mr Tsakalotos said the “overly pessimistic” account led the Fund to a wrong-headed assessment of the country’s debt dynamics, which the report says could reach “explosive” proportions above 200 per cent of GDP without major debt relief or bolder spending cuts and reforms. Greece wants the IMF out of the troika so why does it insist its debt is sustainable? It makes no sense. If its debt was sustainable, the IMF would stay in. I discussed this previously as a blame game scenario, with each party wanting to blame the others, but things have gotten so silly now I find it difficult to twist this pretzel in a way that fits. Meanwhile, Greek unemployment is a “mere” 23%, despite the alleged Greek recovery. The IMF provided this comparison of Greece vs. the Great Depression. Greece does not want the IMF in the troika but if the IMF leaves, Germany is set to pull the plug. There is obviously some sort of game here, but it is logically impossible for Greece to hold the conflicting positions it has. The IMF is due to deliver a major decision on whether it will contribute to the country’s €86bn bailout when finance ministers meet in Brussels later this month. 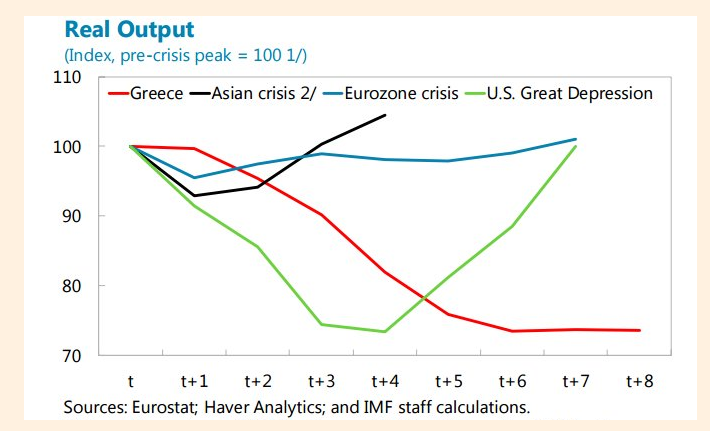 Had Greece warmed up to the IMF, it could have blamed Germany and the IMF. Logically all it can do now is blame itself. Enough of this nonsense, I repeat Dear IMF, Please Put Greece Out of Its Misery. GREEK OFFICIAL SAYS NO BAILOUT DEAL EXPECTED IN MEETING TODAY. In a welcome sign the latest conflict between the troubled Greece’s lenders may be thawing, Reuters reports that Euro zone creditors and the International Monetary Fund have agreed between themselves to present a common stance to Greece later on Friday in talks on reforms and the fiscal path Athens must take, euro zone officials said. As reported earlier this week, a united stance among the Troika would be a breakthrough because the two groups have differed for months on the need to reduce the “explosive” Greek debt burdern and the size of the primary surplus Greece should reach in 2018 and after. Those differences have hindered efforts to unlock further funding for Greece under its latest euro zone bailout program. The IMF hasn’t signed Greece’s third bailout package, but Germany-led eurozone lenders want the IMF to rejoin the bailout as a lender. “There is agreement to present a united front to the Greeks,” a senior euro zone official quoted by Reuters said, adding that the outcome of Friday’s meeting with the Greeks was still unclear and it was unclear if Athens would accept the proposals. “What comes out of it, we will see,” the official said. Jeroen Dijsselbloem, the chairman of euro zone finance ministers, said in The Hague that Friday’s meeting, in which Greek Finance Minister Euclid Tsakalotos will take part, was to discuss the size of Greece’s primary surplus. While the euro zone, or rather mostly Germany, wants Greece to reach a primary surplus of 3.5% of GDP and keep it there for many years, the IMF believes that with reforms in place now Greece will reach only 1.5% and has been pushing for Athens to legislate new measures that would safeguard the agreed euro zone targets. Meanwhile, the Greek Syriza government, elected to fight against lend-imposed austerity, has been loathe to make more cuts that will hit its battered citizens. Lenders have previously accused Greece of stalling on previously agreed upon reforms which, like in the past, have not been implemented. As such, the Greek response remains the big wildcard. As the WSJ adds, if Greece accepts the proposal, representatives from the institutions could return to Athens as soon as next week and sort out the details, before a meeting of eurozone finance ministers on Feb. 20. Several Greek officials told the WSJ that the Greek government would be willing to make fiscal concessions for after 2018 if it misses fiscal targets. But the Greeks want a “comprehensive agreement” that would include a clearer description of the country’s fiscal path, enough to make Greek bonds eligible for the ECB’s QE program. However, in an ongoing multivariable hurdle, the ECB has said Greek bonds would only be eligible for its quantitative-easing program if the current review of Greece’s bailout is completed and an agreement to restructure the eurozone’s loans to Athens removes concerns about the sustainability of the country’s high debts. Until now, Germany has been insisting on a two-step sequence, in which Greece first signs up to more austerity before Berlin sits down with the IMF to see how much debt relief is still necessary. Greece’s Economy Minister Dimitri Papadimitriou has called all sides to offer something at the same time, in order for an agreement to be reached. “Negotiation is like dancing the tango: you need both and who would make the first move is not clear,” he said. The good news for Greece is that it doesn’t urgently need bailout cash until large debt falls due in July. But all sides would prefer to reach an agreement before Europe’s attention shifts to its packed domestic political calendar, which includes elections in the Netherlands, France and Germany. While the latest Greek crisis is still far from resolved, markets took heart from the news, and as a result Greece’s two-year bond yield tumbled 130 basis points to 8.7% after rising above the 10% mark on Thursday as worries about the bailout drove away buyers from Greece’s illiquid paper. Scenario 5: Grexit? Oh pleeease! Earlier this week we reported that Germany’s default swaps spiked to the highest level since Brexit after a surprising new poll from INSA showed that Angela Merkel’s CDU would get only 30% of the vote, while the suddenly resurgent SPD would get 31% of the vote. This means that if the German elections were held today, the SPD’s new head, Martin Schulz, would enter any coalition talks as the leader of the largest party, hence becoming Chancellor. It also means that a SPD-Green-Left coalition would currently win exactly 50% of seats, so that a government without the CDU/CSU could even be possible. In effect, the SPD has gained 10%-pts of support in past two (weekly) INSA polls, taking votes away from all other parties (see chart below). Interestingly, the AfD has also suffered a significant decline. In any case, the poll appears to have spurred the CDU to take out the proverbial knives, and in an interview with Germany’s Spiegel, Merkel’s finance minister Wolfgang Schauble said that Martin Schulz is increasingly behaving like U.S. President Donald Trump (presumably the higher the SPD rises in the polls), an attack meant to disparage Merkel’s suddenly ascendent challenger due to Trump’s precipitously low approval in Germany. “If Schulz calls upon his supporters to chant ‘Make Europe great again‘ then that’s almost literally [like] Trump,” Schäuble told Der Spiegel in an interview published Friday. Notably, Schauble accused Schulz – a former European Parliament president where he was the long-time nemesis of UKIPer Nigel Farage – of acting in a “populist way.” Supposedly in polite, traditional Germany, or at least the CDU, that is considered a bad thing. Schäuble said Schulz needed to “think a little [bit more].” He warned that in times when there is a surge in populist movements, politicians should be careful with their language. Ironically so far Schulz’ language, populist or not, is working in his favor, although it is unclear if the recent SPD surge in the polls will continue. The SPD’s move to nominate Schulz as their candidate for chancellor in the September 24 federal election led to a surge in party membership applications. Opinion polls show that backing Schulz helped the party to its highest approval rating since 2013. That said, unlike in the US, where the closer Trump got to the election, the more frequent were comparisons between the real-estate billionaire and Hitler, in Germany this particular ad hominem attack against Schulz by his political opponent will likely be problematic. Despite solid investor appetite for riskier, corporate bonds, it appears that political uncertainty across Europe is startng to create problems for the region’s so-called ‘safest’ borrowers. As Bloomberg reports,France’s government-linked development agency postponed a $1 billion bond sale this week, citing market volatility, while a junk-rated shipping company managed to increase the size of its sale. In a week dominated by bond sales from sovereign and financial issuers, corporate borrowers accounted for three of the four most subscribed deals. Molnlycke Holding AB tops the list, as the surgical product maker’s first debt sale since 2015 pulled in bids nearly 5.4 times the 500 million-euro ($532 million) issue. Investors also clamored to buy Ryanair Holdings Plc’s first bonds since 2015, which it sold two days after reporting earnings. Agence Francaise de Developpement received insufficient orders because of investor concern that the notes would suffer in line with French government bonds amid the country’s fragmented presidential election, according to head of treasury Bokar Cherif. AFD, which holds the third-highest investment-grade rating and provides funding for sustainable projects in developing countries, may wait until after elections in April and May to resume the sale, Cherif said in a phone interview. It’s rated AA at S&P Global Ratings and Fitch Ratings. Some top-rated borrowers are vulnerable to price swings in sovereign debt because their fortunes are so closely linked to underlying rates. The threat of an anti-establishment president in France, along with elections from Germany to the Netherlands, potential deadlock in Italy and Britain’s negotiations to exit the European Union may damp investor demand for the highest-rated notes at the same time as the European Central Bank prepares to curtail its purchases. “There’s a lot of known political risk in Europe this year,” said Roger Webb, a London-based investment director at Aberdeen Asset Management Plc, which manages about 303 billion pounds ($381 billion). Hundreds of thousands of Iranians rallied on Friday, taking to the streets of Tehran to celebrate the anniversary of the Islamic Revolution and denounce President Trump’s recent statements about Iran. On the anniversary of Iran’s 1979 Islamic Revolution which toppled the U.S.-backed House of Pahlavi, a flod of marchers, including hundreds of military personnel and policemen headed towards Tehran’s Azadi (Freedom) Square. They carried “Death to America” banners and effigies of Trump, while a military police band played traditional Iranian revolutionary songs. Iranian TV showed footage of people stepping on Trump’s picture in a central Tehran street. Marchers carried the Iranian flag and banners saying: “Thanks Mr. Trump for showing the real face of America.””America and Trump cannot do a damn thing. We are ready to sacrifice our lives for our leader”, a young Iranian man told state TV in a reference to Supreme Leader Ayatollah Ali Khamenei. Last week, Trump put Iran “on notice” in reaction to a Jan. 29 Iranian missile test and imposed fresh sanctions on individuals and entities. Iran said it will not halt its missile program. The statement may have had the effect of solidifying Iran’s resolve as leading religious and political figures, including Pragmatist President Hassan Rouhani had called on Iranians to join the rally on Friday to “show their unbreakable ties with the Supreme Leader and the Islamic Republic”. In a speech marking the revolution’s anniversary, Rouhani urged Iran’s faction-ridden elite to seek unity amid increased tensions with the United States. “Some inexperienced figures in the region and America are threatening Iran […] They should know that the language of threats has never worked with Iran. They should learn to respect Iran and Iranians. We will strongly confront any warmongering policies,” Rouhani told the crowd at the Azadi Square, as cited by Reuters, which reported that millions had shown up to commemorate the occasion across the country. As Reuters adds, the rallies were rife with anti-U.S. and anti-Israeli sentiment. Some carried pictures of Trump, Israeli Prime Minister Benjamin Netanyahu and British Prime Minister Theresa May captioned “Death to the Devil Triangle”. “This turnout of people is a strong response to false remarks by the new leaders of America,” Rouhani told state TV, which said millions had turned out at rallies across Iran. U.S. flags were burned as is traditional although many Iranians on social media such as Twitter and Facebook used the hashtag #LoveBeyondFlags to urge an end to flag-burning during the anniversary. They also thanked Americans for opposing Trump’s executive order banning entry to the United States to travellers from seven mainly Muslim countries, including Iran. Trump’s travel ban is being challenged in U.S. courts. Some marchers carried banners that read : “Thanks to American people for supporting Muslims”. The protest comes after Iran’s most powerful authority, Supreme Leader Ayatollah Ali Khamenei, called on Iranians earlier this week to demonstrate against the US to show Iran was not frightened of their “threats.” “[Trump] says ‘You should be afraid of me.’ No! The Iranian people will respond to his words on February 10 and will show their stance against such threats,” Khamenei said on Tuesday. Oil jumped this morning, with Brent rising 1%, trading above $56 after the International Energy Agency said OPEC had achieved record initial compliance of 90% with planned production cuts – it is unclear how much of this was self-reported and questionable – while demand grew faster than expected. In the first month of OPEC’s supply cut agreement, key member Saudi Arabia reduced production by 116%, or even more than it had committed, despite Venezuela’s struggles to reduce output (it had achieved only 18% of planned cuts) while higher demand is aiding the group’s bid to re-balance world markets, the IEA said. The IEA, which advises industrial nations on energy policy, said that if current compliance levels are maintained, the global oil stocks overhang that has weighed on prices should fall by about 600,000 barrels per day (bpd) in the next six months. The IEA also estimated that 11 producers including Russia, Kazakhstan pumped 269k b/d less crude in January versus October-November levels, citing preliminary data. The IEA also increased its 2016 estimates for world oil demand growth for a third month, and boosted its outlook for 2017, anticipating an increase of 1.4 million barrels a day this year. World oil inventories will fall by 600,000 barrels a day during the first half of the year if OPEC sticks to its agreement, the IEA said. Oil has fluctuated above $50 a barrel since a deal to trim output between OPEC and 11 other nations took effect on Jan. 1. U.S. producers are taking advantage of higher prices by increasing drilling activity and boosting daily output to the highest level since April, a dynamic the IEA said is capping prices in the mid-$50s. … which threatens to disrupt the much desired supply/demand equilibrium. USA oil rigs continue to escalate in count which no doubt raises total crude production. What will OPEC do if the market does bit rebalance? News headlines in the oil markets were no doubt mostly bearish this week, a turnaround from what we saw at the beginning of the year when markets were still on their OPEC-induced high. Hedge funds and other investors have clearly overbought, the EIA expects shale to boom back to 9.5 million barrels per day (mbd) in 2018, U.S. stocks rose by a massive 14 million barrels last week, and OPEC producers not bound by quota (Libya and Nigeria) are pumping more volumes. There’s another issue worth noting—the OPEC cut might not be steep enough to rebalance supply and demand and also drain bloated inventories. Nothing will change materially in the market until there’s a significant stock draw, a development that appears doubtful, which could ultimately force OPEC to change strategy once again. The market has yet to achieve a deficit, although we are only a month and a half into the production cut. Based on the latest data from the EIA, OPEC slashed output by 910,000 barrels per day (b/d) in January, 76 percent compliance, but the global market was in surplus by more than 700,000 b/d. If OPEC continues at its current production levels for the rest of the year, and demand grows at the expected clip of 1.6 mbd, the global market will eventually see a draw. But this outlook makes a number of big assumptions that may not pan out. First, OPEC is now producing at lower levels than its 32.5 mbd target established at its Vienna meeting in November. In January, most producers adhered more or less to their respective targets, with the Saudis cutting output by 520,000 b/d, some 34,000 b/d more than what they committed. Iraq is a big question mark, but it has made some cuts. The country reduced output by 120,000 b/d last month, short of its 210,000 b/d pledge. Kuwait and UAE, close allies of the Saudis, have reduced output according to plan, by the tune of 140,000 b/d for each, while Iran is right at its output target. It’s not certain that compliance will last, however. Throttling back at this time of the year is not a huge burden given that demand ebbs ahead of the second quarter. Later in the year, as demand picks up, will producers resist the urge to cheat? The EIA is forecasting a 1.28 mbd demand jump from the second to third quarters. And just as important, Libya and Nigeria, both of which increased output in January, loom over the deal since they are not held back by quotas. Another issue is non-OPEC supply, particularly U.S. shale. The EIA sees U.S. production returning to growth this year, putting output outside the cartel up 280,000 b/d this year. This confluence of factors—OPEC’s cuts, moderate non-OPEC growth, and robust demand—would bring about an OECD commercial inventory draw of a modest 21 million barrels, or 57,500 b/d, for 2017, not nearly large enough to significantly alter market sentiment. Of course, the draw may be smaller if OPEC members don’t continue to commit to their pledges, non-OPEC supply surprises more to the upside, or demand does not reach expectations. Furthermore, the oil market looks to be very sloppy in 2018, with non-OPEC forecast to grow by 1 mbd (with almost half of that in the U.S.) and OECD commercial stocks set to build by 41 million barrels, more than counterbalancing declines this year, according to the EIA. With these factors ahead, OPEC’s will to continue to cut will be sorely tested. OPEC to go back to pumping all out? So, what does OPEC do at its meeting in late May and throughout the rest of this year? The deal struck last year, which included cuts from some non-OPEC suppliers, was for only six months, with the option to extend for another half year if there’s unanimous agreement. It’s clear with the quick resurgence of the shale patch with oil prices back above $50, OPEC is back to competing with shale, posing the same dilemma it wrestled with in late 2014. The Saudis then resisted the calls from other OPEC members to cut back, preferring to hold onto market share and weed out higher-cost non-OPEC suppliers instead of trying to support prices. If members continue on the current path during the second half of the year, they would do so because of the understanding they’d have to stick it out in order to see the benefits of the current strategy. Given that oil prices failed to reach $60 for the time being and there are signs the rebalance won’t happen until the second half of the year, if it happens at all, an extension in May is likely. The real test, though, will come next year with a return to surplus. Against that backdrop, OPEC would have to throttle back even more to keep the market balanced, a burden that would fall mostly on the Saudis, particularly if some producers—most notably Iraq—end up cheating. In a situation such as that, Saudi Arabia may return to relying on strong demand growth and lower prices curtailing upstream investment to underpin its longer-term market share, instead of cutting back to prop up prices. Though Falih was confident in a swift rebalancing, he didn’t rule out continuing the current strategy. But his message could also be understood as a tough message to other members that the Saudis won’t continue on the current path indefinitely. To be sure, the dynamic that played out from 2014-16 of OPEC versus shale has not gone away, and may in fact have been intensified with the cartel’s decision last year. That should lead, at some point, to a rethink in approach during another era of surging shale production. Ask any economist or trader over drinks, or in any other setting, what they think about Chinese economic data or financial reporting and the answer will be one and the same: it’s all fake. And it’s not just skeptical outsiders who share this view: China has made it all too easy for anyone to be convinced, with reports such as this one “China Threatens Its Economists And Analysts To Only Write Bullish Reports, Or Else“, and, of course “Chinese Province Admits It Fabricated Economic Data For Three Years.” Apparently, China is also a master when it comes to deadpan humor and/or self-referential irony – or is merely galactically obtuse – because on Thursday China’s Vice Premier, Zhang Gaoli, warned that economic statistics “must not be fabricated” and that those caught manipulating data should be punished and face consequences in their careers. According to Xinhua, the central government requires authentic and reliable economic data to set policy, and China should have a traceable system to punish those found responsible for faking statistics, Zhang said Wednesday during a visit to the National Bureau of Statistics, the official Xinhua News Agency reported. Zhang also encouraged local authorities and other agencies to better coordinate their work and enact statistical reforms. Following the recent humiliation when in January it was revealed that Liaoning province had faked its fiscal revenue and other statistics from 2011 to 2014, the government was humiliated, not so much that Chinese data was fabricated data – everyone knew that was the case long ago – but that it was caught. And since the genie was officially out of the bottle, Beijing had no choice but to show a bold facade and signal that China’s leaders are “attaching greater importance to data accuracy”, to demonstrate to the world just how serious it is in cracking down against data manipulators. Meanwhile, Bloomberg reported last month that the central government has planned steps that will “improve” the independence of data collection and reduce the influence of local governments. In other words, Beijing is trying to scapegoat provinces and regional governments, for engaging in what it itself does. And since the data rigging will not end for the economy which always comes within 0.1% – and usually just above – of the “consensus” GDP number, we wonder if the Chinese government will be as quick to “punish” its own members once more data manipulation cases are exposed following the crackdown on “regionally” fabricated data. We doubt it. The 30 yr bond yield 3.024, UP 2 IN BASIS POINTS from THURSDAY night. USA dollar index early FRIDAY morning: 100.85 UP 18 CENT(S) from THURSDAY’s close. The British pound at 5 pm: Great Britain Pound/USA: 1.2474 : down 20 BASIS POINTS. The 9th Circuit Court of Appeals has unanimously ruled for the U.S. to remain open to refugees and visa holders from seven Muslim-majority countries while the Trump administration fights to reinstate a travel ban in the name of national security. The San Francisco-based appeals court on Thursday denied the government’s request to close the doors after days of public debate over President Donald Trump’s attacks on the judicial system and a rush of fearful immigrants. The ruling increases the likelihood that the administration will ask the Supreme Court to step into a case that’s the biggest test of Trump’s executive power yet. As Bloomberg notes, the panel’s ruling in favor of immigrants is a victory not only for Washington and Minnesota, the plaintiff states who sued Donald Trump et al., but for Facebook, Google and Microsoft which said in court papers that the measure would hinder their global businesses. The appeals court refused to reinstate Trump’s order after a Seattle judge halted enforcement while courts decide whether it’s constitutional. “The courts seem to be so political,” Trump said in a speech on Wednesday. “It’s so sad.” Traditionally, presidents have shied from commenting on active cases for fear of being accused of trying to influence judges. The president’s action initially denied entry to an Iraqi who helped U.S. military, professors at University of Massachusetts and a student seeking to bring her daughter for medical treatment. The ban set off angry protests nationwide and attracted a flurry of lawsuits and adverse rulings. None was more sweeping than that of U.S. District Judge James Robart in Seattle. Washington and Minnesota won the order temporarily blocking the ban nationwide after arguing it hurt their residents and employers including Microsoft, Amazon.com Inc. and the Mayo Clinic. The punchline and the one sentence that will infuriate Trump, is the following in which the court says it is “beyond question” that the courts have the authority to oversee the President. The fight, however, is far from over. The court battle so far has focused on whether the president’s order should be paused while courts weigh larger issues. Robart already ordered both sides to submit additional arguments focusing on the substance of the case: whether the states have a right to sue and whether Trump’s order discriminates against Muslims. Ultimately, the case is likely to end up before the US Supreme Court. 2 words, ALL CAPS, and all making it very clear that a Supreme Court clash is now imminent. Concurrently, the US Department of Justice has said that it is reviewing the Appeals Court decision on the Trump travel ban and is “considering its options.” Based on the Trump tweet, the option is clear: a showdown at the Supreme Court. Offering the first official glimpse of the parameters of Trump’s “wall” along the US-Mexican border, an internal Department of Homeland Security report seen by Reuters reveals that the structure would be a series of fences and walls that would cost as much as $21.6 billion, and take some three and a half years to construct. The proposed cost is much higher than the $12-billion figure cited by Trump during his campaign and also higher than the $15 billion cited by Republican House Speaker Paul Ryan and Senate Majority Leader Mitch McConnell. This latest leaked report is expected to be presented to DHS Secretary John Kelly in the coming days, although the administration will not necessarily take the actions it recommends. Allegedly the new border wall will be completed in three phases, with the first phase covering only 26 miles around the easily accessible areas surrounding San Diego, CA and El Paso, Texas. Among other things, starting with the easiest and most accessible sections of the wall will allow President Trump to declare an early victory on a key campaign promise. Phase two of the project would cover another 151 miles around other large border cities while phase three would effectively seal off the border. Of course, getting funding for the wall is likely one of the easier challenges the President will face from Democrats who will be all too eager to throw up every roadblock possible to thwart it’s construction. A source familiar with the plans told Reuters that DHS will almost certainly face environment challenges and may have to go to court to seek eminent domain in order to acquire some of the private land needed to cover the final and most ambitious phase of construction. The report assumes DHS would get funding from Congress by April or May, giving the department sufficient time to secure contractors and begin construction by September. DHS and White House representatives refused to comment on the alleged report saying they do “not comment on or confirm the potential existence of pre-decisional, deliberative documents” and that it would be “premature” to comment on a report that has not officially been presented to the president. And while Reuters notes fairly extensive details about cost estimates and staging of construction, there is no mention of how/if/when U.S. taxpayers will be reimbursed the $22 billion price tag by Mexico. We’re awaiting official confirmation from Vicente Fox on when he expects Mexico to cut a check. After a couple of months of animal-spirit-inducing exuberance in soft-survey-hope-data, UMich consumer sentiment printed a disappointing 95.7 in Feb (versus 98.0 exp and down from 98.5 in Jan). The biggest driver was a notable drop in ‘hope’ as Democrats Expectations plunged near record lows. The Democrat’s Expectations Index is close to its historic low (indicating recession) and the Republican’s Expectations Index is near its historic high (indicating expansion). While currently distorted by partisanship, the best bet is that the gap will narrow to match a more moderate pace of growth. Nonetheless, it has been long known that negative rather than positive expectations are more influential in determining spending, so forecasts of consumer expenditures must take into account a higher likelihood of asymmetric downside risks. Finally we note University of Michigan’s comments that when asked to describe any recent news that they had heard about the economy, 30% spontaneously mentioned some favorable aspect of Trump’s policies, and 29% unfavorably referred to Trump’s economic policies. Thus a total of nearly six-in-ten consumers made a positive or negative mention of government policies. In the long history of the surveys, this total had never reached even half that amount, except for five surveys in 2013 and 2014 that were solely dominated by negative references to the debt and fiscal cliff crises. In Search Of A Pension Fix (When None Is Possible): What Happens? As I pointed out long ago, there is no possible fix to the Dallas pension mess except massive haircuts to pension payouts. Given The pension board does not want to admit that, nor the mayor, nor the city council, it was inevitable talks would disintegrate into finger-pointing and lawsuits. The story is a bit convoluted and hard to follow without the background so for those unfamiliar here are some articles to bring the story up-to-date. With the background out of the way, please consider ‘Politics of intimidation,’ or family feud? Anger grows as Dallas Police and Fire Pension System looks for fix. Both his maneuver and the council members’ request to have a court take control of the pension system have added more friction to the deeply strained relationship between City Hall and active and retired police and firefighters. Some hope still remains that they’ll find a way to save the pension system from insolvency. But so far, talks have gone nowhere, and tensions are running high. Council member Scott Griggs said Friar engaged in “the politics of intimidation.” He said the fact Friar spent time and energy on the resolution underscored why the fund needs an independent court-appointed receiver making decisions. Deputy Mayor Pro Tem Erik Wilson said he understands why Friar drafted the resolution, even though he was “taken aback” by it. Dallas Firefighters Association President Jim McDade agreed but believes city officials are disingenuous. State House Pensions Committee Chairman Dan Flynn and his staff are looking at a proposal that would pay out the lump-sum payments as annuities over retirees’ projected lifespan. The retirees might also be able to sell their stream of payments to private financial institutions in exchange for a lump sum. But it would save the pension fund from losing nearly half its value and save retirees from seeing the interest they earned disappear. But the board still expressed some reservations about the idea. Still, none disagreed that it would be better than the city’s plan. The source of the bickering is clear: The numbers don’t work. To get the pension plan a mere 70% funded would require a taxpayer bailout of $1.1 billion dollars. Of course, that assumes stock prices keep rising. Taxpayers should not be on the hook for this mess. The promises were bound to fail from the get go. The fault for this mess is squarely in the hands of politicians, not those running the fund. Nearly every public pension plan in the nation is severely underfunded. There is nothing special about Dallas. There is only one practical solution: cancel the plan for future employees while slashing benefits accrued. No one wants to admit that, so lawsuits and pamphlets are flying. By the way, please note we have these problems with the stock market at an all-time high. Dallas is not unique. The entire state of Illinois is in an even worse predicament. Even flat market performance for a number of years will bankrupt nearly every public pension plan in the country given 7.5% to 8.0% pension plan assumptions.